Success! Another geolocator in hand. Our second tagged bird proved more elusive than the first. Though initially interested in the playback from the phone, he would not come close to the bow net. The constant wind whipping over the tundra also made a stationary mist net impractical. We settled in to observe the behavior patterns and routine of the bird banded with the colors Orange-White-Orange, our geo-tagged sandpiper. Semipalmated Sandpipers are generally not very wary of humans on the nesting grounds, and Orange-White-Orange was no exception. Very quickly he allowed us to approach to within a few meters when foraging around his favorite ponds. Our winning solution to capturing him was a slow and patient stalk while holding a mist net between us. Our strategy was complicated by the lumpy tussocks and mounds that cover the wet tundra. The first time we dropped the net on Orange-White-Orange, he was able to sneak out the side between two tussocks. Fortunately he did not seem to realize that we were responsible for his near-capture, and he allowed us to approach closely again. This time we chose a relatively open area near the edge of a pond and waited for him to forage his way into the catch zone. Working in close coordination, we flipped the net over the little sandpiper and seconds later had him in hand! After the second capture and geotag removal, we turned to searching the vast landscape for the rest of our tagged birds. The first two birds were right back on their territories from last year. This faithful return to the same territory each year is a characteristic of many shorebirds, but the rest of our tagged birds have not arrived. 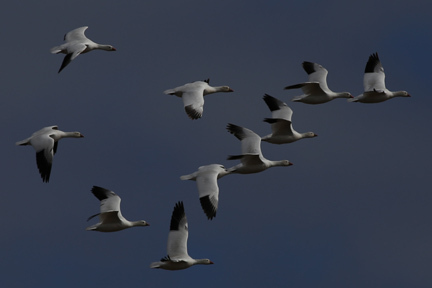 We don’t know if this means they did not survive the winter, or if they have gone elsewhere in the nesting range, or possibly stopped somewhere on their way north this year. Hopefully the data from our two recovered tags will give us clues about the location and nature of the risks facing this population. In the meantime, our search area has expanded from last year’s territories to the entire tundra for kilometers around. This vast search area gives us ample opportunity to encounter and appreciate the other wild residents of Coats Island. The head feathers of a male King Eider become ruffled while the bird is preening. Male eiders are moving off of the tundra and back to sea now, where they will stay until next year. The female eiders who successfully incubate and hatch their eggs will remain with the chicks on the tundra ponds until the chicks can fly in late August or September. Photo by Shiloh Schulte after a 20 minute crawl through a tundra wetland to get close to this glamorous bird. King Eiders are improbable inhabitants of the tundra landscape. Their well-rounded bodies, large heads, and heavy belabored lift-offs make them a poor fit for this Coats Island terrain. We are surrounded by tundra that is a mix of small shallow ponds (most of them less than knee deep), dry linear gravel ridges that we generously call eskers since they appear to be a form of glacial deposits, creamy brown oozing mud boils from breaks underground in the permafrost, and patterned ground of hummocks, dwarfed willows, and wetland tussocks of grass and sedge. This landscape hardly fits the world of a sea duck, yet King Eiders are quite abundant around here. Male King Eiders in particular, with heads so ornate they rival any Toucan, stand out against the browns and grays of the mid-June tundra vegetation. We can spot male eiders at considerable distances on the edge of the small ponds in our study area. The females are richly mottled brown, and if it were not for their closely guarding male companions, would be nearly invisible to us. These large ducks spend most of the year in icy, wind-whipped northern ocean waters and come inland only to nest. Other open ocean wanderers shift seasonally from the horizontal plain of the sea to the treeless world of the Canadian and Alaskan Arctic. Red Phalarope and Red-necked Phalarope both nest here. These small, brightly-colored shorebirds spend most of their time swimming and foraging in ponds, a rare ability for a shorebird. 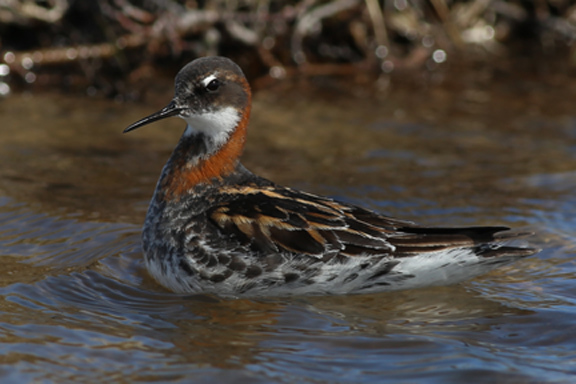 We have many Red Phalarope nesting in our study site, and we did see a pair of the diminutive but beautiful Red-necked Phalarope bobbing around in a shallow pool several days ago. The larger and more vibrant female phalaropes hand off all incubation and chick rearing duties to the duller males. In the fall the phalaropes head back out to the open ocean and spend the rest of the year at sea. Parasitic, Pomarine, and Long-tailed Jaegers all spend most of the year stealing fish from other seabirds or picking off warblers on migration over both the Atlantic and Pacific pelagic waters. 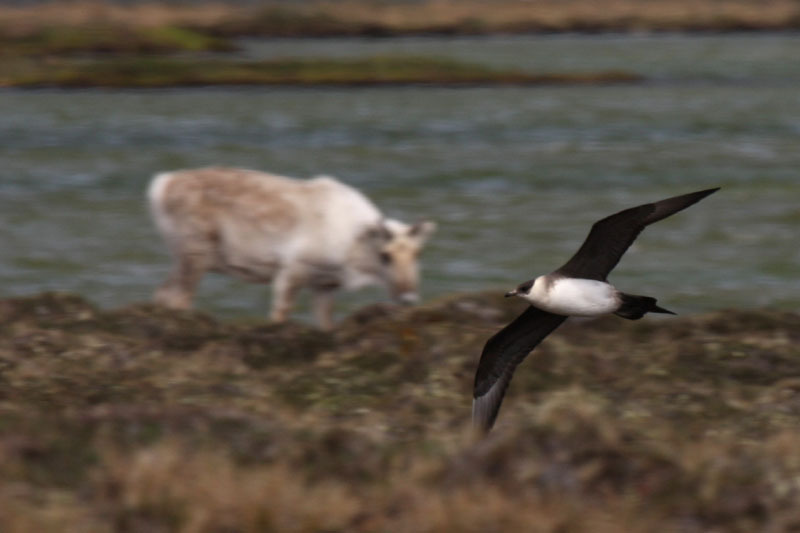 When inland, jaegers cruise the tundra with the same undulating flights that they do over the waves out at sea. This rhythmic dance on the wind can identify the bird as a jaeger even at great distances. Jaegers too must come to the tundra to breed, laying one or two dark olive eggs in shallow nests on the ground. 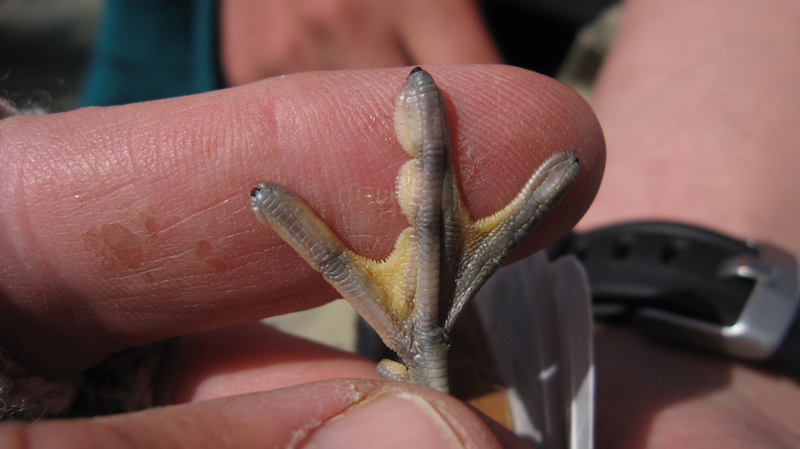 They are the supreme predators of eggs, chicks, and even adult shorebirds on these northern nesting grounds. When two are hunting in synchrony they can successfully steal eggs from birds as large as geese. Shiloh watched yesterday as a Parasitic Jaeger harassed an eider until she gave up her nest to the aerially astute predator. The scene Shiloh was witnessing quickly turned into a “Planet Earth moment,” when the jaeger also caught the attention of a white Arctic Fox. The fox read the jaeger’s harassing behavior and streaked like a tiny tundra hyena almost half of a mile to claim the eider eggs for itself before the jaeger could crack them open. Shiloh was impressed with the fox and thought he could almost hear Sir David Attenborough’s voice narrating the scene. Thank you for painting the scenes so well, and for the excellent photos. I was just thinking that the narrative sounded like a TV special when Sir Attenborough was mentioned. Your weather doesn’t look too bad. Thanks for the updates. It is fun to think of you guys being the only humans on the island. No wonder you are having Sir Attenborough moments! Your photos are stunning, as usual. You have our rapt attention now that you have secured 2 locators. We can’t wait to hear the next report so I hope you have lots to fill us in with the next blog VERY soon! 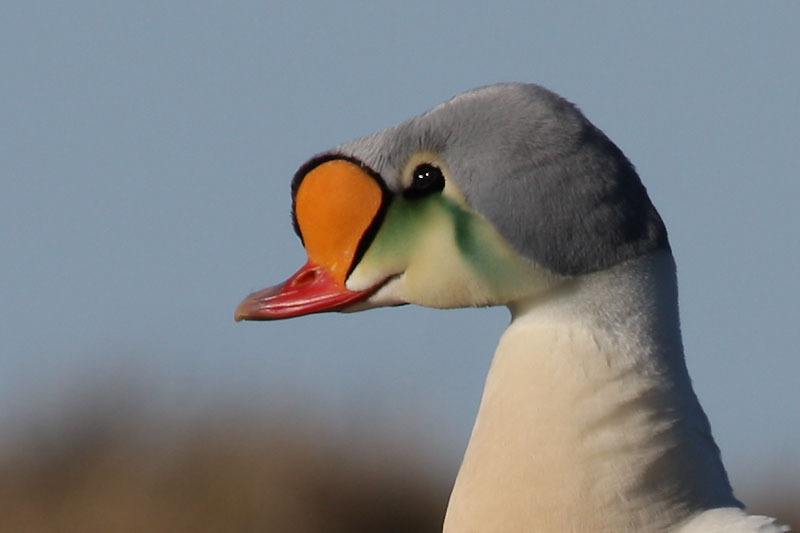 Stunning close-up glamour shot of the King Eider! I wish we had more of those in Nome. I can recommend flick-netting for retrieving your geolocators, for birds that aren’t as amenable to stalking and “drop-netting”. Same principle as for drop-netting, but instead of dropping the net over the bird, have a 3rd person “twinkle” your foraging bird gently in the direction of the net (have the two people holding the net crouch quite low and unobtrusively, holding the net low horizontal to the ground), then when the bird flies (hopefully towards and between the people with the net), quickly whip the net up vertically and presto! One captured sandpiper. This worked for catching 3 of our geolocator SESA this year, particularly for the males. A little playback might help move the bird around towards the net. Hope you don’t have as much predation as we have in Nome! Nests are getting massively munched by jaegars and foxes, we’ve got birds on their 3rd nesting attempt. Hi guys, I think your adventures are fascinating, and I love the photos too! I’m posting them on the Facebook page of the project I’m running: https://www.facebook.com/pages/The-Flyway-Print-Exchange/175252916007801 Thanks so much – it’s great to follow, and adds so much to the wonderful stories of the Flyways. Thanks – and good luck!! !